This collection of the top Hot Apple Cider Recipes includes all the best alcoholic, non-alcoholic and easy hot cider recipes. This step-by-step tutorial explains how to make extra-spiced crockpot hot apple cider recipe. It's an easy, non-alcoholic cider recipe that's great for serving crowds during the holidays. This easy apple cider recipe includes butter, brown sugar and dark rum for a rich flavor. Like Hot Buttered Rum, it's a wonderful drink to help you warm up after time in the snow. This unusual Chai-spiced hot apple cider recipe features traditional masala chai spices, like allspice, cinnamon, cloves, cardamom and ginger, for a deeply spiced flavor. It also includes a little almond milk, which adds richness to the drink. Similarly, Preeti's spiced apple cider recipe uses many Indian spices for its warming flavor. Wassail is a traditional German version of hot apple cider. It's typically served in the fall and winter, once apples are harvested. This Wassail hot cider recipe is made with orange juice, lemon juice and apple juice, as well as a range of spices (including crystallized ginger). If you like this recipe, be sure to check out this Basic Wassail Recipe and this crockpot Wassail recipe, too. Start with store-bought apple cider. Mull with warming spices and real maple syrup. Serve hot. Delicious! This alcoholic apple cider recipe can be made with apple brandy or with whiskey. It's a variation on a Hot Toddy, which is usually made with whiskey, hot water or tea, and lemon. 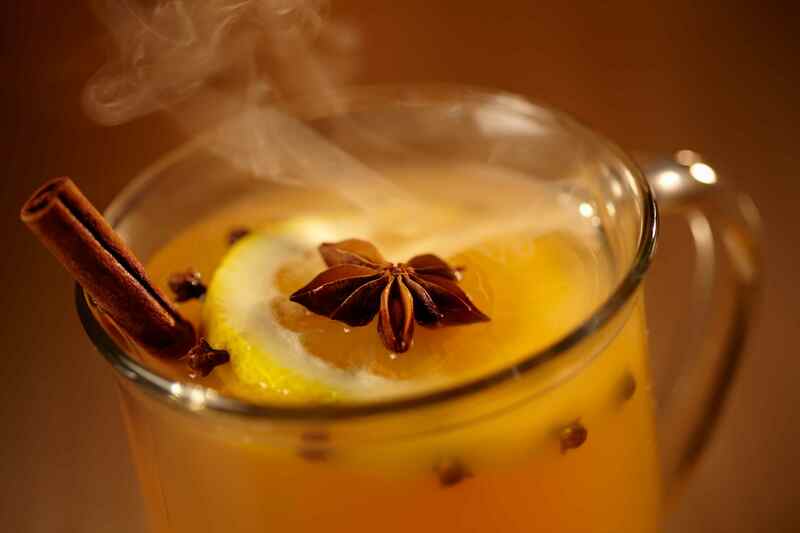 This traditional New England hot apple cider recipe includes spices, orange juice and brandy. If you like New England-style cider, check out this collection of cold and hot apple cider recipes. If you prefer your recipes in video format, this is the best hot apple cider recipe for you. Sweet & spicy hot apple cider takes store-bought apple cider and spices it up with cinnamon, allspice, cloves, lemon zest, brown sugar, dark rum and Butterscotch Schnapps. As the name suggests, it's about as sweet as it is spicy!